Bertolet was waived by the Jets on Saturday, Manish Mehta of the New York Daily News reports. 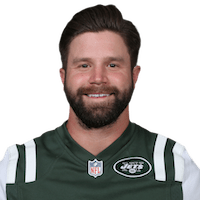 Analysis: Jason Myers beat out Bertolet for the kicker job after converting a 58-yard field goal in the preseason finale. It's been awhile since a Jets kicker deserved fantasy consideration as anything more than a bye-week replacement. Bertolet is now competing with Jason Myers for the kicking job, Manish Mehta of the New York Daily News reports. Analysis: With Cairo Santos (groin) unable to stay healthy, the Jets put in a waiver claim on Myers, who was let go by the Seahawks on Monday. Bertolet should have the advantage, considering he's made all three of his field-goal attempts and all three of his PATs during the preseason. It's hard to imagine a Jets kicker warranting roster consideration as anything more than a bye-week replacement this year. Bertolet connected on both of his field-goal attempts and an extra point in Thursday's 15-13 preseason loss to the Redskins. Analysis: Bertolet's long in this one was 36 yards, so he hasn't showcased anything special. Cairo Santos (groin) should take back the starting job once he's healthy, but Bertolet could make a name for himself if he continues to drill all of his kicks. Bertolet will handle all of the Jets placekicking duties while Cairo Santos (groin) remains sidelined, Rich Cimini of ESPN reports. Analysis: A rookie out of Texas A&M, Bertolet would likely require a strong training camp to unseat Santos for the starting gig. He will be afforded an opportunity to do so with Santos sidelined and connected on his only field-goal attempt during the first preseason tilt. There are no videos available for Taylor Bertolet. Click here to view all videos.